Building an online business without building an email list is like building a house without a foundation. 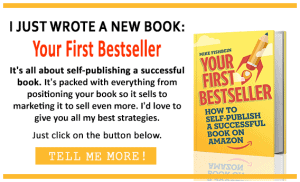 I made this mistake when I first started my Amazon self-publishing business and had to learn quick to prevent it from crumbling. But I did, I learned fast, and now I can show you 7 steps you can use to build your list right from the beginning. An ever increasing, engaged e-mail list is the driving force behind any great online marketer. And, as self published authors, our e-mail subscribers can equate to continual customers, which means more sales for our books. Attracting one time visitors to your site or your book is like filling a leaky bucket with water. They’ll look around, hopefully buy a book or two, and then likely move on and never return. The bucket never fills, meaning your pockets never do either. A much better business model is to convert traffic into continual paying customers. This can be tricky though, so how do I do it? I use e-mail marketing to build my list and continue providing value to my subscribers through autoresponders. This is a highly effective strategy to increasing your customer lifetime value and boosting sales. I’ll walk you through exactly how to do it below. To start, it’s helpful to understand, from the customer’s perspective, what process they go through from discovering our book up to subscribing to our email list. …by searching for a keyword or getting a recommendation from a product page they are viewing. …for example BuckBooks and other promotion sites. …such as blog posts, slideshares, guest posts, etc. Once they have found your book, they purchase it and read it. While reading, they see a link to a free ebook you have written, providing more information or further steps. This incentivizes them to give you their e-mail address in order to download it. Remember, you can’t just expect their details without providing value in return. They click on the link through to the landing page where they sign up to receive the free ebook. 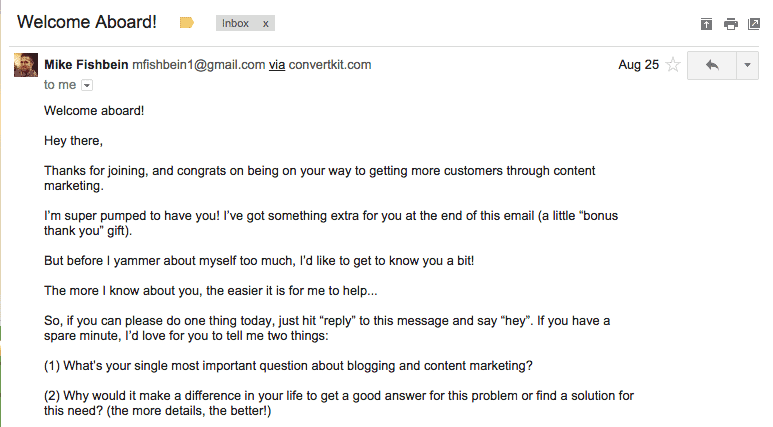 This adds value to the reader and another e-mail address to your growing list. Now that they are on your list you can send them future promotions, updates, content etc. To streamline my process, I set up autoresponders so my readers continue to receive content and book sales promotions without me spending anymore time. I recently switched to LeadPages to optimize my landing pages for conversion. LeadPages makes it really simple to create landing pages that not only look good but convert as well. This is a very effective strategy for collecting email addresses. Provide something of value to incentivize them to sign up. Even if you’re offering your ebook for free, you still need to lure potential readers in with great copywriting and design. If your writing skills aren’t up to it, hire a writer through Upwork to help you out. 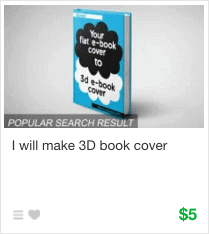 On the design side, I use Fiverr to create a 3D cover of the book I am offering. With an autoresponder course, readers continue to get offers and value without you spending more time. I’ve created personalized courses according to what they signed up for. 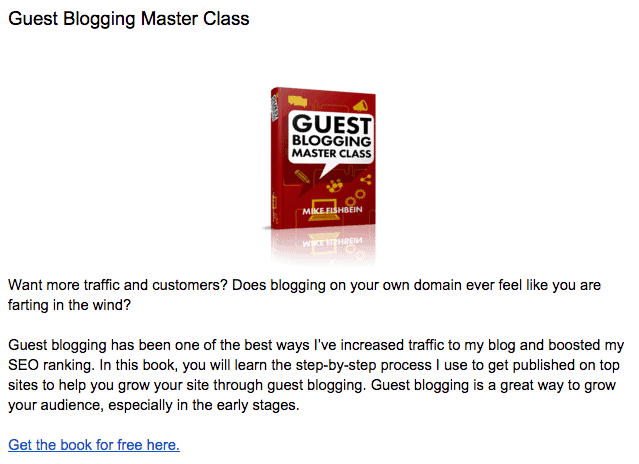 So, if they sign up for my ebook on guest blogging, they receive emails that contain advice on guest blogging. They also get links to blog posts I’ve written where they can learn more, along with sales copy to buy my book. Autoresponders are a great tool for asking customer development questions so you can create even better content. In my welcome e-mail I include my customer development questions and encourage readers to respond with any topic-related questions they might have too. If you’re using ConvertKit, you can do this by appending ?ref=YourCampaignName to the landing page URL to create a new campaign. Alternatively, you can use Bitly, the PrettyLink WordPress plugin, install Google Analytics on your page and tag the url you use, or use the analytics provided by Leadpages or your preferred provider. 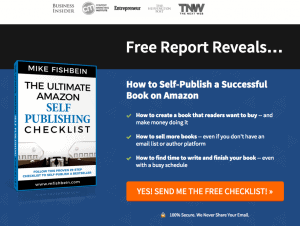 Self-publishing on Amazon is a great way to reach more potential readers and customers. By converting readers into email subscribers you can continue to market to them on your own accord. Offering a free ebook provides value and offers an incentive in exchange for their email addresses. Once you start building your list you can use autoresponders to reach readers directly, increasing your reach and your book sales. Write an awesome book jam-packed with value, and readers will be excited to read more books by you. It will also help you get more readers on Amazon, which will trickle down to email subscribers. Use an effective marketing strategy to get your book in front of as many people as possible. Download the checklist below to learn exactly how I create books that people want to buy and the market strategies I’ve used to sell thousands of books.